My cousin Jen e-mailed me this picture that I've never seen before. I absolutely love old pictures and this one is amazing. The baby in this picture is my Grandma, Arlene Shawcroft (my mom's mom). 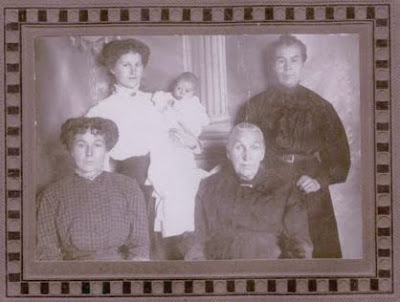 Holding her is her mother Grandma Gert, below her is her mother, and then her mother is standing to the right and then her mother is right front. I have a picture of my great, great, great, great, grandma. Isn't this absolutely amazing!!! I've got a new look on here and I like it. It took me forever to figure out how to do all of this stuff, but with the help of my good friend Cori it is now done!!! Thanks Cori!!!! So I am trying to drop some pounds and eating better. I am trying healthy low-fat recipes and I'd thought that I'd share them with you as I try them. Most of the recipes are from the biggest loser family cookbook. This is a breakfast sandwich that my whole family loves. I have never had turkey bacon before but I like it. I kept my eggs mostly together instead of chopping them up while they cooked. I added a slice of reduced fat cheese and covered it for a minute until it was melted. Then added it to a toasted english muffin and added the bacon. When shopping for the english muffins I found that there were 100 calorie ones but they cost $3.80 for 6. The regular english muffins are 110 caloris and cost $1.24 for 6. For 10 more calories at a fraction of the price I will go with the regular ones. These pictures are for my mom and dad. My mom has many pic's of the grandkids with a big stuffed animal right by them. Here's Brett with his fluffy doggie!!! I like to move it move it!!! I got a cardio biggest loser workout that the kids were excited to do. I did the workout for awhile and then decided to sit down and supervise. Taylor is playing in a hockey league and is absolutely loving it. The first game she was barely moving on her roller skates but now she is moving pretty good. She falls down alot but this last game she actually touched the puck!!! I took some pic's of Olivia and Brett today. Olivia has to be in the right mood or she is pretty hard. Brett on the other hand doens't mind me snapping dozens of pictures. I can't believe it is 2010. We had some friends over for a little party and had a great time. I cannot believe that ALL the kids were awake for the big countdown, even Brett!!! !